MetaQuotes is releasing an update to MetaTrader 4 on the 4th of February, 2017. It is important that if your MT4 Build is 950 or lower that you update your MT4 to avoid losing trading access. If your MT4 Build is higher than 950 then you are not required to make any changes and your platform will automatically update. Please be aware if you are using an EA there is a possibility you may experience loss of functionality as some third-party EA providers might not support the updated version. 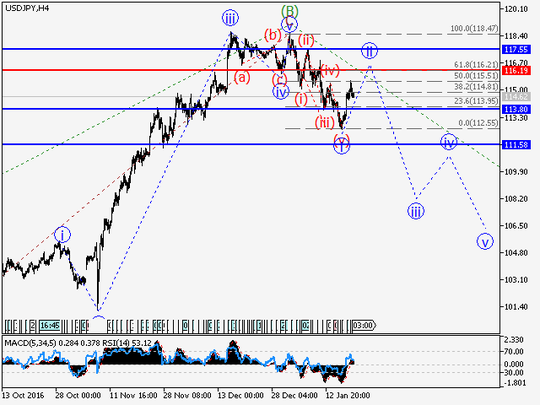 USD/JPY Wave analysis and forecast for 20.01 – 27.01: Downtrend continues. Estimated pivot point is at the level of 116.19. 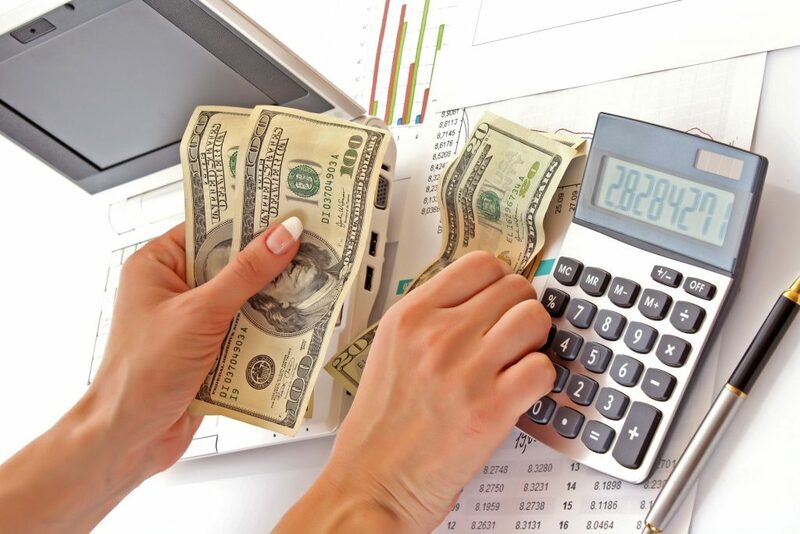 Our opinion: Sell the pair from correction below the level of 116.19 with the target of 113.80 – 111.58. Alternative scenario: Breakout and consolidation of the price above the level of 116.19 will trigger further rise to 117.55. Analysis: Presumably, the formation of the wave (С) continues, within which the first wave has been formed. Locally, it is likely that the upward correction as the wave ii is being formed, within which an impetus (a) has been formed and the wave (b) is being developed. If this assumption is correct, the pair may go down to 113.80 – 111.58. Critical level for this scenario is 116.19. 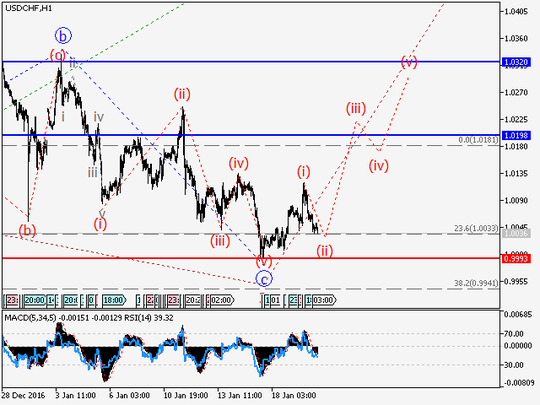 USD/CHF Wave analysis and forecast for 20.01 – 27.01: The pair is likely to rise. Estimated pivot point is at the level of 0.9993. 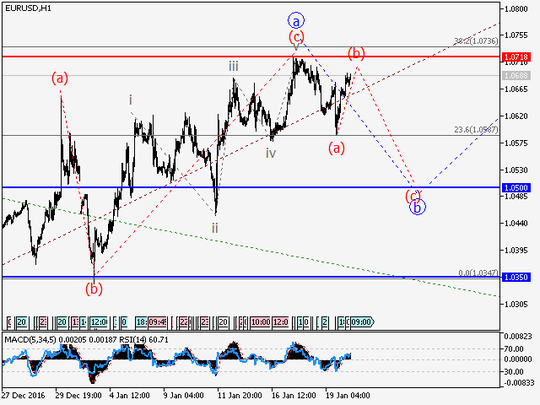 Our opinion: Buy the pair from correction above the level of 0.9993 with the target of 1.0198. Alternative scenario: Breakdown and consolidation of the price below the level of 0.9993 will trigger further decline in the pair to 0.9940. Analysis: Presumably, the formation of the downward correction, as the wave 2, which took a shape of the irregular plane, has completed. Locally, it is likely that the first wave of the junior level (i) has been formed and the correction (ii) is being developed. If this assumption is correct, the pair may go up to 1.0198. Critical level for this scenario is 0.9993. 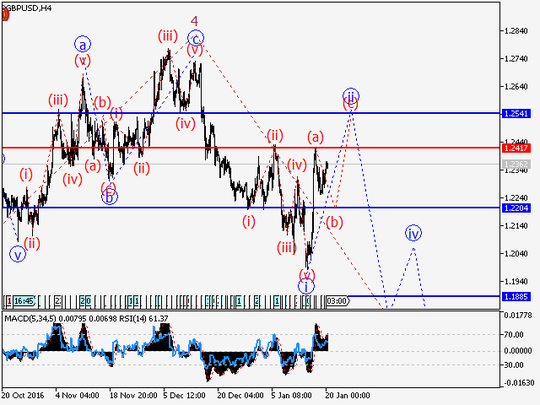 GBP/USD Wave analysis and forecast for 20.01 – 27.01: The pair is in correction. Estimated pivot point is at the level of 1.2417. 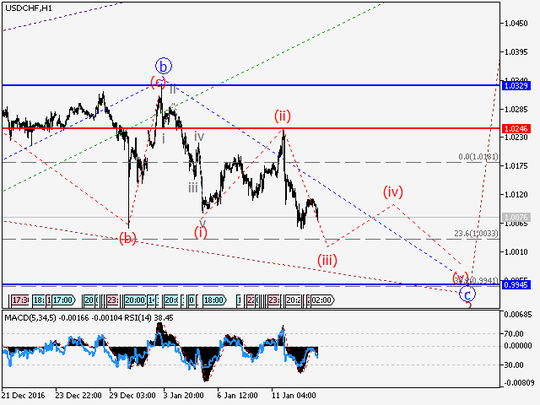 Our opinion: Sell the pair from correction below the level of 1.2417 with the target of 1.2204 – 1.1885. Alternative scenario: Breakout and consolidation of the price above the level of 1.2417 will trigger further rise in the pair to 1.2540. Analysis: Presumably, the formation of the fifth wave of the senior level continues. Locally, it is likely that the first wave as the wedge i of 5, has formed and the upward correction as the wave ii of 5 is being developed, within which upward impetus has been formed (a) and the wave (b) is being developed. 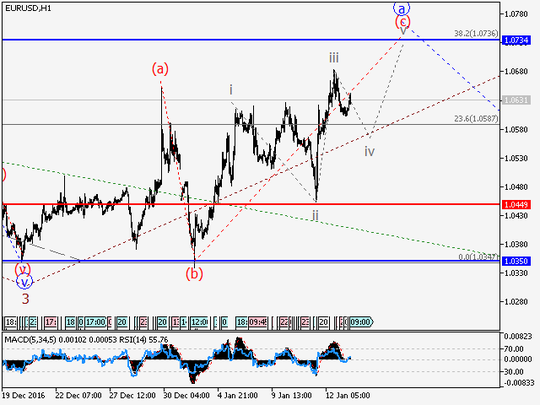 If this assumption is correct, the pair may continue to decline to 1.2204 within the wave (b). Critical level for this scenario is 1.2417. 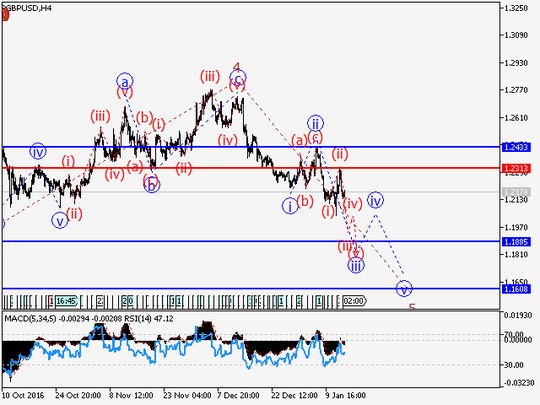 EUR/USD Wave analysis and forecast for 20.01 – 27.01: The pair is likely to decline. Estimated pivot point is at the level of 1.0718. 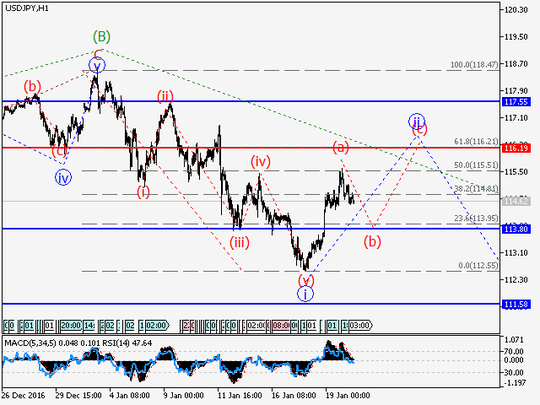 Our opinion: Sell the pair from correction below the level of 1.0718 with the target of 1.0500. Alternative scenario: Breakout and consolidation of the price above the level of 1.0718 may trigger further rise in the pair up to 1.0856. Analysis: Presumably, the formation of the upward correction as the fourth wave of the senior level, continues. Locally it seems that the wave a of 4 has completed, while the wave b of 4 is being formed. If this assumption is correct, the pair will continue to decline to 1.0500. Critical level for this scenario is 1.0718. 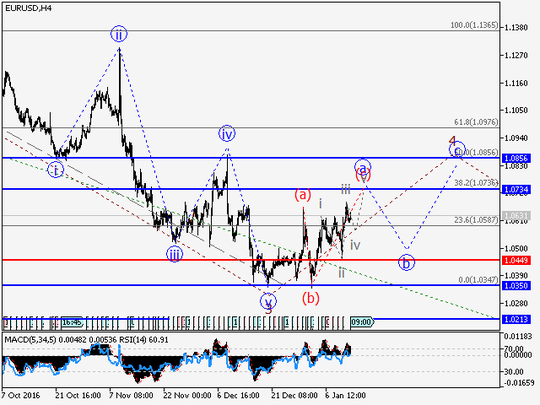 USD/CHF Wave analysis and forecast for 13.01 – 20.01: Decline in the pair is likely to continue. Estimated pivot point is at the level of 1.0246. 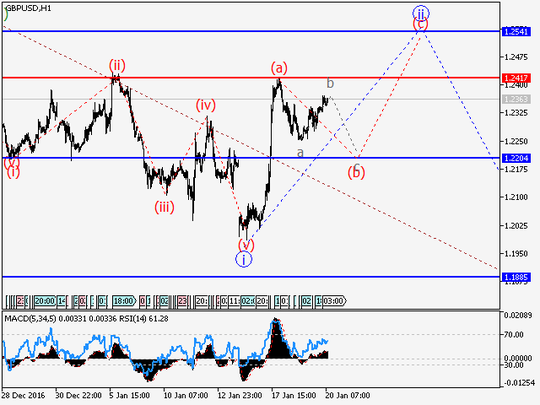 Our opinion: Sell the pair from correction below the level of 1.0246 with the target of 0.9945. Alternative scenario: Breakout and consolidation of the price above the level of 1.0246 will trigger further rise in the pair up to 1.0329. Analysis: Presumably, the formation of the downward correction continues, as the wave 2, which takes a shape of the irregular plane. Locally, it is likely that the wave c of 2 is being formed, within which the third wave (iii) is being developed. If this assumption is correct, the pair may go down to 0.9945. Critical level for this scenario is 1.0246. 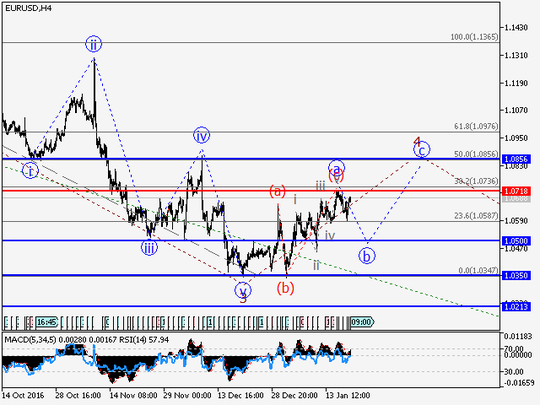 GBP/USD Wave analysis and forecast for 13.01 – 20.01: Downtrend continues. Estimated pivot point is at the level of 1.2313. 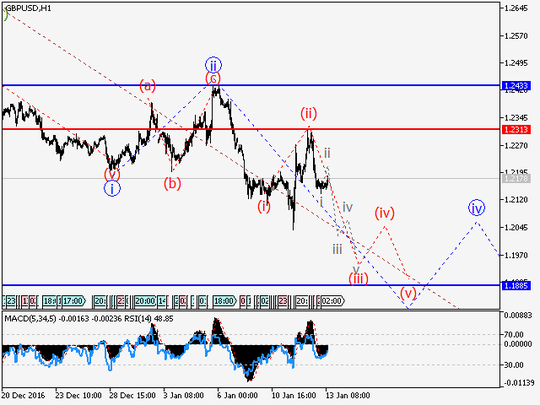 Our opinion: Sell the pair from correction below the level of 1.2313 with the target of 1.1185. Alternative scenario: Breakout and consolidation of the price above the level of 1.2313 will trigger further rise in the pair to 1.2433. Analysis: Presumably, the formation of the fifth wave of the senior level continues. Locally, it is likely that the third wave of the junior level iii of 5 is being developed, within which the wave (ii) has completed. If this assumption is correct, the pair may continue to decline to 1.1885. Critical level for this scenario is 1.2313. 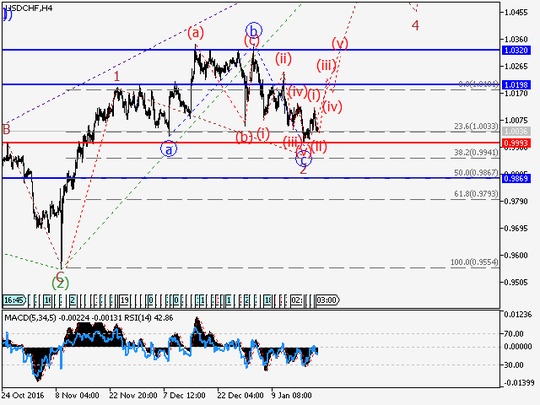 EUR/USD Wave analysis and forecast for 13.01 – 20.01: The rise in the pair is likely to continue. Estimated pivot point is at the level of 1.0449. 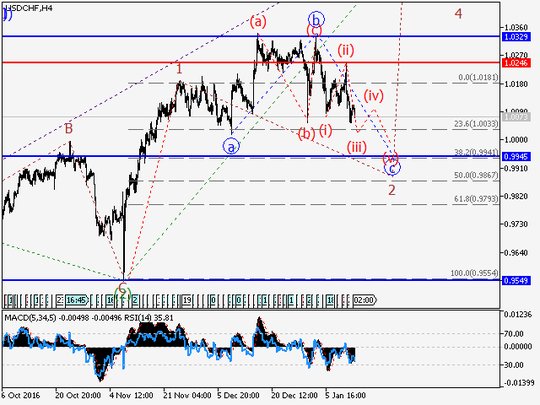 Our opinion: Buy the pair from correction above the level of 1.0449 with the target of 1.0734 – 1.0856. Alternative scenario: Breakdown and consolidation of the price below the level of 1.0449 may trigger further decline in the pair to 1.0350 – 1.02. Analysis: Presumably, the formation of the upward correction as the fourth wave of the senior level, continues. Locally it seems that the wave a of 4 is being developed, within which the wave (с), as a wedge, is being formed. If this assumption is correct, the pair will continue to rise up to 1.0734 – 1.0856. Critical level for this scenario is 1.0449. 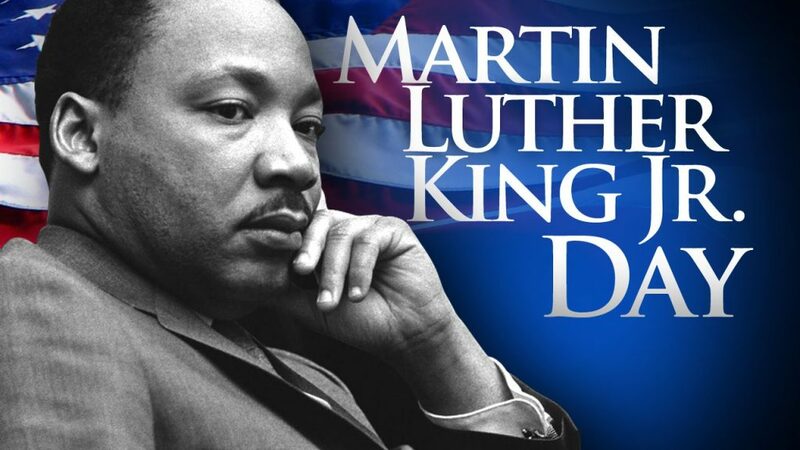 We would like to draw your attention to the trading schedule over the upcoming Martin Luther King Day in United States of America on 16th of January 2017. Please note that trading hours for some instruments will be affected.